Although I’d been running for almost two weeks following about four weeks of rest “forced” on me by an injury sustained during the CTS South Devon marathon, I was still not at 100% strength or fitness. I’d run a half marathon distance on the flat Thames Path a week before this event and a hard tempo run two days before, I was slower than before the injury, but that’s hardly surprising. I didn’t have too many doubts about being able to complete the distance, but the +720m of elevation was in my mind; would my knee stand up to the climbs, and would it stand up to the pounding of the descents? If I was going to run at what has become my standard effort on these events i.e. walk the uphills (because I’m weak) and run the downhills, then I’d figured this adventure was going to take me about 2h15m to complete; including a few stops to take some photos. I’ve got a friend back home in Perth who has been on the sidelines from running for almost three months due to a knee injury; as I’d been on the sidelines too for a similar reason, I was dedicating my run to her. As I’d already told her I was doing this (running for those who cannot) I was hoping that I’d not let her down. Tracy had been having 4AM starts for her work, so by Friday lunchtime she was finished working for the week. We set off for Eastbourne in Sussex which was supposed to be a two hour drive. We decided to avoid the M25 and its Friday afternoon traffic and made our way south on lesser roads. As it turns out (again) we should have taken the main road as the small roads were considerably slower and not much more scenic than the motorway. More than three hours after leaving Maidenhead we were arriving at The Cavendish Hotel on the waterfront in Eastbourne. The first thing we noticed about our hotel was that it was wrapped in scaffolding, as were most of the waterfront hotels we passed on the way into town; it must be the season for renovations. From the outside, the hotel smelled of wet paint. We got to our room via the scariest elevator ride and found the ocean view framed by more scaffolding and the room also smelled of paint. This is why the room was half price! 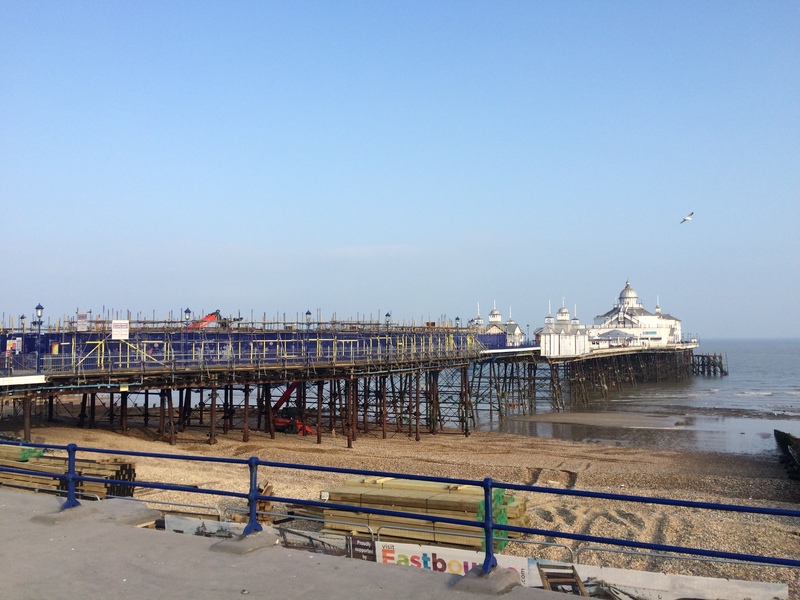 Before it got dark, we went for a wander along the beach front to view the Eastbourne Pier which was being repaired after a major fire in 2014. From there we found a nice pub, The Town House, located a couple of streets back from the ocean; it had been recently renovated and smelled of paint too! I had a pint and Tracy had a glass of wine as we perused the menu and made the decision to come back to the pub for dinner a bit later, which we did after some more wandering around town, and it was good. We did some more wandering after dinner, and eventually found ourselves back at the hotel (surviving the elevator again) for an early night. As I was running the half-marathon instead of my usual marathon distance at previous CTS events, we didn’t need to get up as early as “normal” because the start was later in the morning. I also thought I’d have the hotel breakfast as I’d been missing the breakfasts which had been paid for with the rooms at our accommodations for previous events. In the morning, we were both awake early (not a good sign). I got my running gear on and did a modified pre-run routine, I didn’t have my porridge or coffee. We risked the ride in the elevator for the final time, and having survived unscathed, went into the dining room for a buffet breakfast. There was so much food laid out, however a lot of it was meat based so Tracy didn’t eat it, and a lot of it was food I wouldn’t eat before a hard run. I only had some toast, fruit and coffee; I’m still not sure why we keep paying for bed and full breakfast? 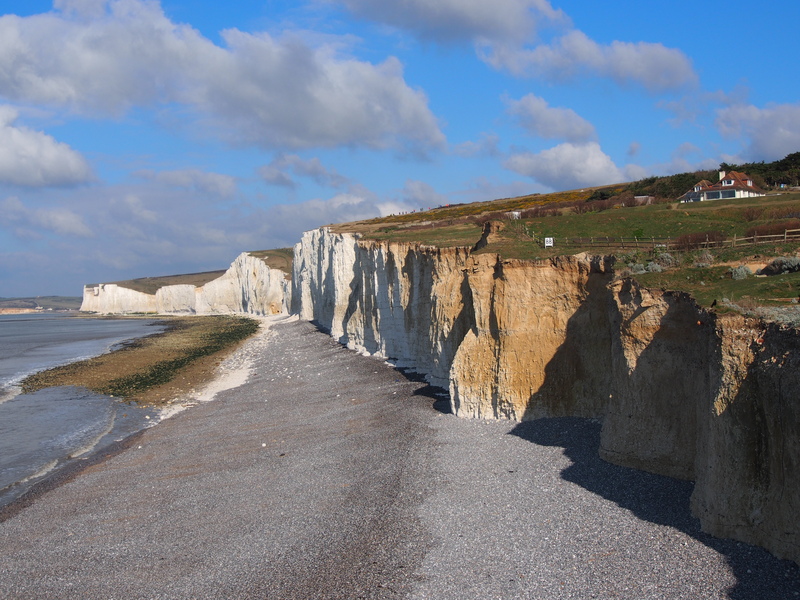 Once we had finished breakfast, we headed off for the 15 minute drive from Eastbourne to the start at Birling Gap. Tracy was able to drop me at the Endurancelife CTS “village” and went off to find a place to park whilst I registered. Something felt different about this event than previous CTS events; there were ultra-runners wandering around and looking a little edgy and there was a long line of mainly marathon runners still waiting to register. I joined the end of the queue and waited; I had registered for the marathon I needed to change my registration to the shorter distance. In an effort to get the queue moving, some of the event staff came along the line to take some details, then another volunteer came along to take the same details; when the third volunteer came along to take the same details again I knew something wasn’t quite right this time. I eventually got into the registration tent and thankfully there was no problem in changing my entry to the half-marathon. Oddly, the two runners in front of me had to get their details taken as they hadn’t been taken correctly by any of the three volunteers earlier! 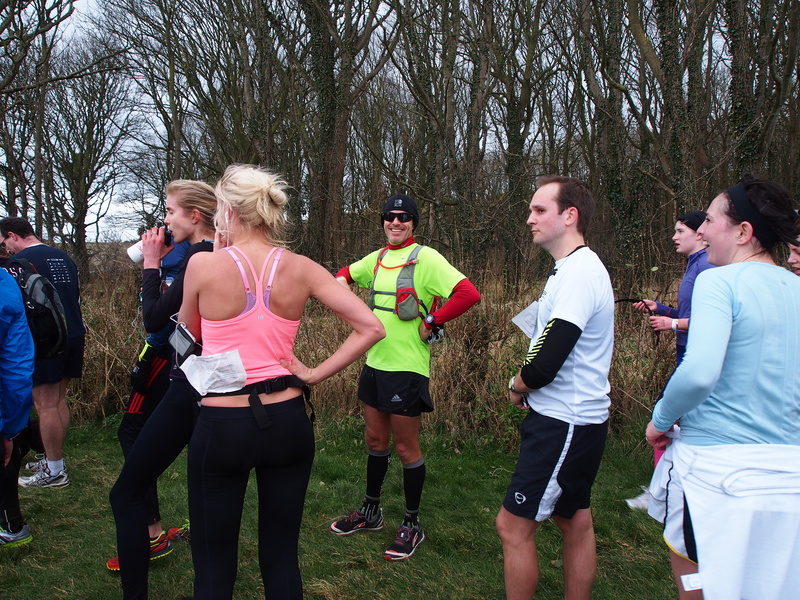 The ultra’s briefing started a few minutes late and then there was a short walk from the village to the start line. After a few words from the Race Director and the obligatory countdown, they were off. A few frontrunners headed off fast from the go, but the rest were more subdued; there didn’t seem to be as many shouts and hoots from this starting group as at other events. After the ultras had all but disappeared up the hills of the Seven Sisters cliffs we headed back to the village. The line for registration was now longer as the half-marathoners were now queuing. The marathoners were wandering around waiting for their briefing and start, which eventually happened. Again, there seemed to be less fanfare amongst the marathon runners than at previous events; I couldn’t figure out why? All I knew was that I wanted to be in that start group. When we got back to the village area again, it was even more jammed with even more half-marathoners queuing and a constant stream of 10km runners arriving too. The event website says registration for the half-marathon was from 08:15 to 09:45; it was a bit after 10:00 and there were still half-marathon runners arriving to register; obviously, many people had not read the instructions on the event website? After a long while, event staff were moving along the long line of runners waiting to register to identify the half-marathoners and move them to the front of the line. Our briefing was supposed to start at 10:00 but was delayed; I was getting antsy, as were a few others. 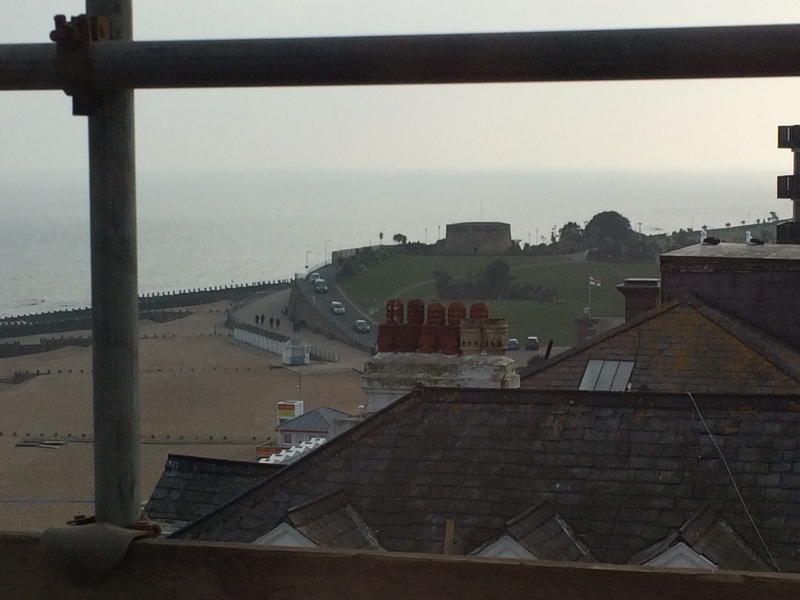 When we woke up in Eastbourne, the sun was shining through a few scattered clouds. I decided I would wear shorts as the course was less likely to be through brambles and the weather was considerably warmer. I’d also decided on just a long sleeved shirt with a t-shirt and my thick jacket. By the time our briefing started, the sky was thick with clouds, the wind had picked up and the temperature dropped; I was very cold and couldn’t wait to get running to warm up. I was starting to wonder how much energy shivering uses. It might have been boredom, it might have been to keep my energy levels topped up; for whatever reason, I ate the free Clif bar given to me at registration. It felt to me like we were very late, but in fact things weren’t too far behind the promulgated schedule. We had our briefing and made our way to the start line. As there were so many runners, the Race Director made an announcement using a loud-hailer there would be two starts; one start is for the “competitive” group who were eligible to claim race prizes and they would have a “mass” start with each of them having the same start time. The remainder, who could not claim event prizes even if they did run really fast times, would wait a moment or two after the competitive group started and have their individual start times recorded using the timing chips attached to our wrists. The process had been detailed on the event website, but I was beginning to think that most of the competitors around me had not read those instructions either. Finally, the competitive group started and shot off into the distance as the rest of us shuffled towards the start line where volunteers were scanning our timing chips, and then we could start running. 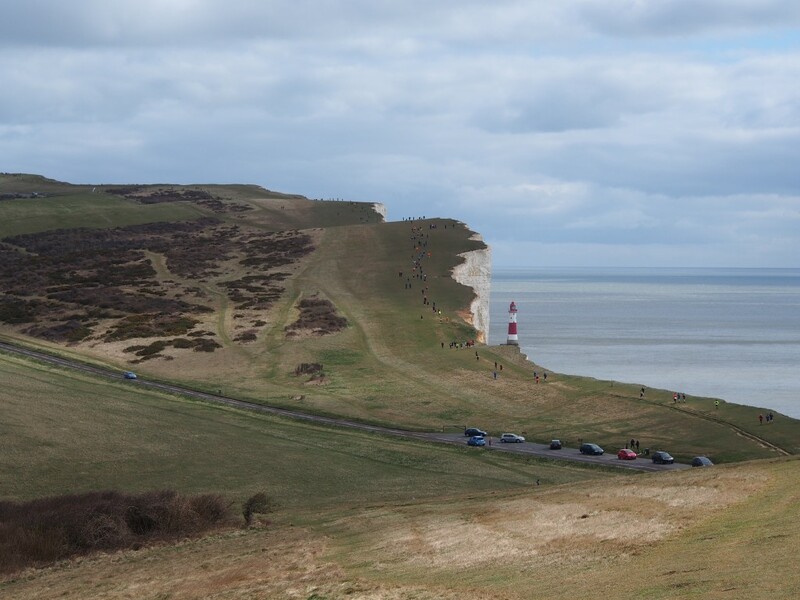 The half-marathon course starts just near Birling Gap then goes west along the cliff edge near the Seven Sisters on the South Downs Way. We only go over three of the “sisters” then turn inland, uphill to pass just south of the village of East Dean. 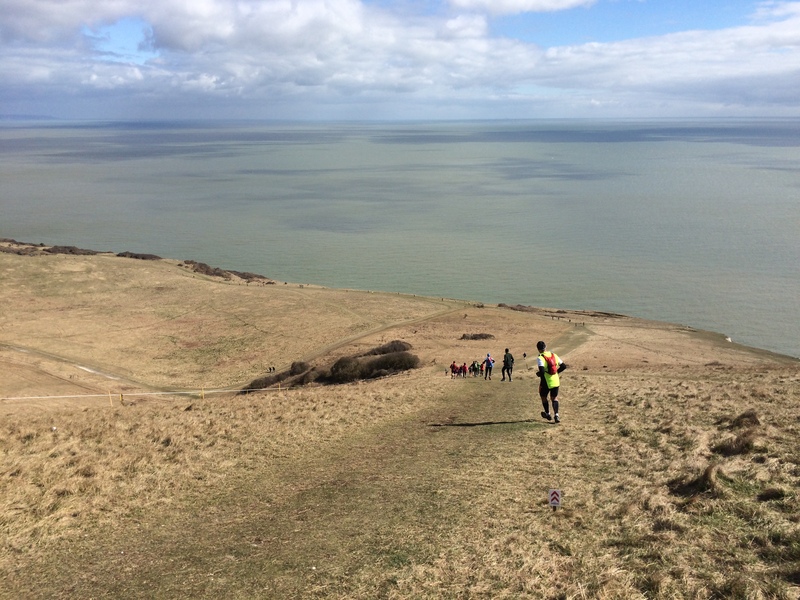 There’s a checkpoint at 2.5M (4km) just before East Dean, then it’s back to Birling Gap where the course passes near to the start and heads east along more cliffs. There’s a checkpoint on the way but we don’t have to check in there. The course follows the coastline which turns north, taking us to the southern outskirts of Eastbourne and another checkpoint at 8M (12.8km). We turn away from the coast and head west, inland until we near Birling Gap where we will be able to see the finish area, but turn away from it just before we get there to add in a few miles to make up the distance. A bit of a tease? The total elevation is in the order of 720m according to Google. I had forgotten that shorter distance runners are faster than the more pedestrian pace of the ultras and marathoners. People were flying passed me left and right at speeds I could maybe match for a few hundred metres, but certainly not for a half-marathon distance. 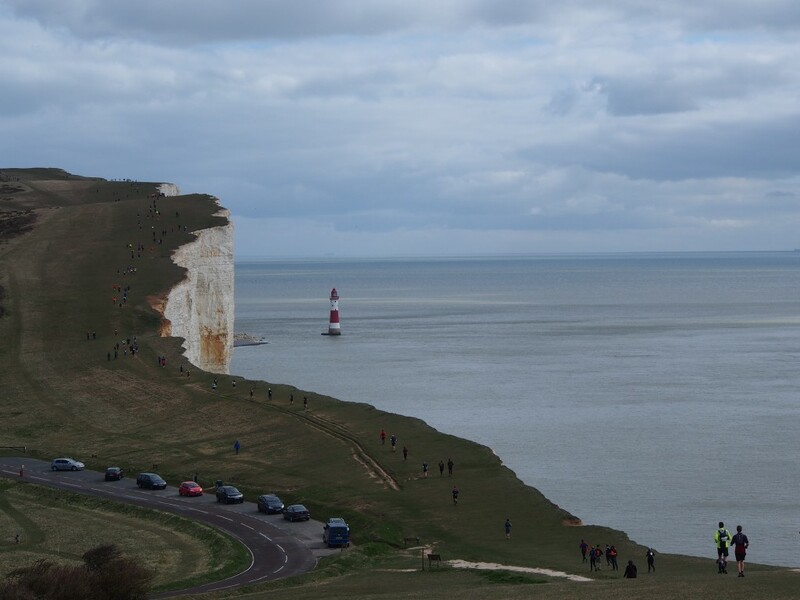 I stuck to my plan and kept shuffling towards the cliffs of the Seven Sisters. 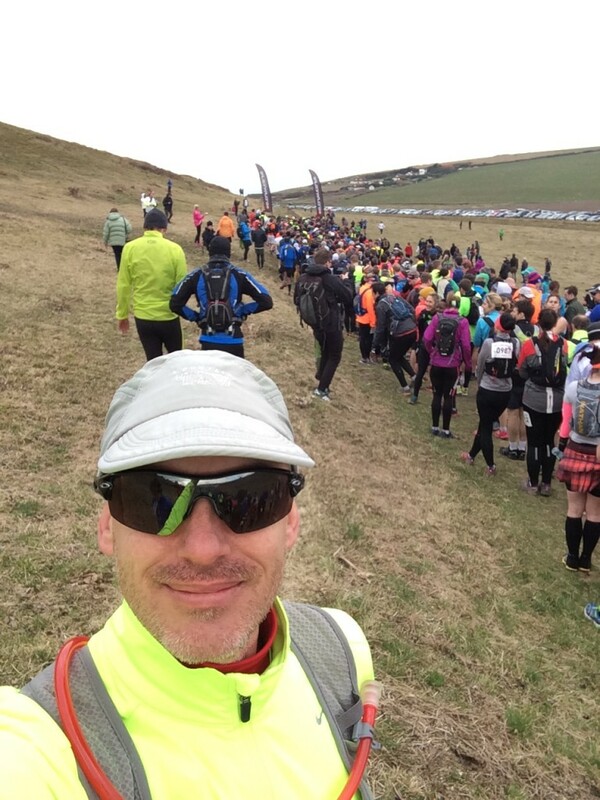 As the course rolled uphill and down again, I started passing some of those who had sprinted passed me just after the start, but as my legs were still feeling particularly weak on the uphills, I walked and other runners came passed. In the previous marathon events, by the end of the first couple of miles, the runners had basically sorted themselves out and got into a line with the faster runners leading the way, but this wasn’t the case for this half-marathon. It seemed to take a long time before the “pecking order” was established but then it kept changing as people changed speed. Eventually, we got to the point where we said goodbye to the spectacular views from the top of the cliffs and headed inland, uphill and into a stiff wind. My right knee started “niggling” as did my right hamstring. I backed off the effort a little, but kept plodding across the farmers paddocks; relentless forward progress. Just at the top of the climb was the first checkpoint, CP4 on our maps, then a little after there we turned and started heading back towards the coast again. 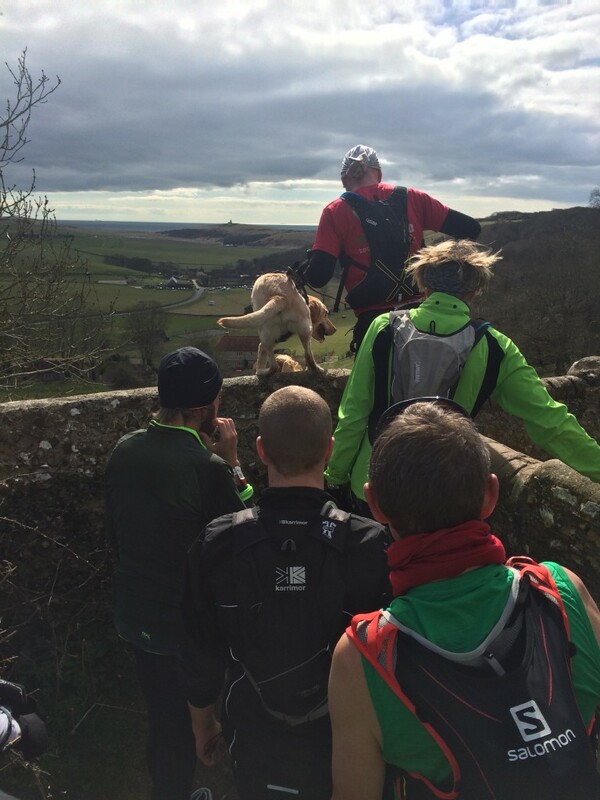 After a few undulations we came to a wall where there was a throng of runners waiting for their turn to try to get over the obstacle; it was more trouble for some than others. People running with dogs, sometimes literally, threw their dogs over the wall and kept on running; I guess local dogs would be used to that sort of treatment? As we were heading back towards where we’d already been, it was downhill as we’d been most recently running uphill. We were in a bit of a lee from the wind and were running in the same direction as the wind; I was warm enough now to brave taking off my jacket (mistake!) My hydration system has a small pouch, it’s only marginally larger than a scrunched up running jacket and getting it securely stashed away on the run was difficult (lesson learned). At about the same time, another runner just ahead of me had the same idea, except that when he opened his bag to stow his jacket, there was a massive explosion of food from his bag! This guy could have fed almost the entire field of runners with the number of gels, bars, lollies and snacks he was carrying! He stopped and picked up some of his travelling smorgasbord, I’m going to guess he didn’t bother to pick up all his spilled faire? Can’t complain it wasn’t scenic enough! We reached the coast again at Birling Gap near where we started. We ducked across a carpark and up a set of coastal steps and some hills to find ourselves running along the clifftops again. The stiff northerly wind was back, it was cold and blowing you straight towards the cliff edge. I saw Tracy at the steps and she had some gloves and my skull cap for me, I should have stopped to put my jacket on again, but it was warm enough when you were in a lee or if the sun popped out from clouds, freezing otherwise, so I was in a bit of a quandary. We followed the coast as it turned north and the course touched the southern end of Eastbourne. We climbed away from the coast on paths and trails until we entered a series of paddocks. The wind wasn’t quite behind us, but the terrain was sloping in our favour and so the going was quite quick. I was averaging 5min/km or so and made up quite a bit of time. There was a woman in front of me who was racing for a sheep station or something; she’d make it very difficult to pass despite calling out to her that you were coming passed. I wasn’t that much quicker than her, so on the next uphill when I slowed to a walk she came trotting by again and then made herself exceptionally difficult to pass yet again on the next section. This went on for some time, she annoyed me so much that on the next downhill section I hammered down and gained a sizable lead that she’d not make up again. We were in the middle of the field and because of the staggered start you didn’t have much idea if the people next to you on the course were ahead or behind you in time. I wasn’t racing, but she was (as were few others near me in the middle of the pack). Throughout the event, I was having some stomach and energy issues. I cannot put my finger on the exact cause, but running a hard tempo training run two days before the event probably didn’t do me any favours. Not having my usual breakfast but instead eating citrus fruit probably didn’t help. By the amount of Blueberry Crisp burping I was doing, eating the Clif bar before the event probably didn’t do me any favours. Being so cold before the start and reluctant to go back to the car and get more clothing probably didn’t me favours either. At the end of the course was a little zig-zag of sorts and a downhill finish. A few hundred metres from the finish line, our course converged with the 10km course, so there people sprinting and some running not so quickly; it was a bit of a shambles but I had worked myself into a gap and so had a bit of clear space ahead and behind me. I crossed the line and looked up to see Tracy waiting with my warm jacket. I looked at my watch and saw my time 2h13m which was two minutes faster than I had planned. I was cold but uninjured, so I was happy with my effort for the day. We walked back to the car where I got changed and we drove back to Maidenhead that afternoon, via the motorways this time and then straight out to dinner with friends at our local pub. After this run I was soooo hungry, more hungry than after any training run or distance event I’d ever done. I scoffed down all the food we had with us in the car, ate more food when we got home, then went out for dinner where we ordered a lot more food! The next day, Tracy and I went for a nice 10km walk along the Jubilee River. When we got home I cooked up a big brunch, then later in the day we popped out to do some more food shopping as I’d eaten just about everything at home. We bought some family-of-four sized pies from Tesco, and I proceeded to eat an entire one by myself, with a bowl of salad. It wasn’t until Tuesday that my almost-instaiable appetite wained. . . slightly. On Monday I went for a recovery run, of sorts. I was wearing my HRM and trying to stay in Zone 2 (easy running). I started on the Thames Path and with a following gentle breeze it was relatively easy to keep in the right training zone. I was feeling pretty good and decided to try and “circumnavigate” Dorney Island, so kept running when I got to Eton and crossed the island to the Jubilee River Path (without getting lost this time, it had to happen sooner or later!) The wind was now coming from the front and when combined with a little fatigue, it became harder to maintain the proper training zone. At times, I was considering walking as I was having trouble running slowly enough to keep my heart rate down. Eventually I made it back home to Maidenhead, 25km completed with an average heart rate just above the target. My legs felt pretty good, but I was hungry again. I’ve not done any interval training since coming to the UK and only done one proper tempo session; the rest of my running has been distance at random pace. Something has changed (not for the better) so I’m going to get back to my proper training schedule in preparation for Perth Marathon to see if I can undo whatever it is that I’ve done since being in the UK. My Garmin used to report my VO2 Max as 52, it’s now 45. If you’ve got a routine, stick to it. Don’t start an event cold. It’s better to be warm and shed clothes as you warm up than think you’ll warm up after the start. Intervals and tempo sessions are vital components of a distance runner’s training. Observation: I think ultras and marathoners are better runners and may be nicer people too?